“I think there is a big attack on Christianity. I believe that’s where we are as a society,” she said. U.S. District Judge John Antoon II, appointed to the bench by then-President Bill Clinton, issued his final opinion and injunction on Nov. 29, declaring that the “county may not require theistic content in opening invocations.” He also ordered the commission to pay $60,000 in compensatory damages to the atheist entities that sued for not being permitted to deliver an invocation. The board consequently temporarily dispensed of the opening prayer while also voting to appeal the ruling, in hopes that it will be overturned by the federal appeals court. “You’ve authorized an appeal. Pending that appeal, we feel it’s appropriate that we do the moment of silence, in lieu of an invocation, instead of trying to come up with a new policy on that. Just wait till the appellate court rules on the existing policy,” attorney Scott Knox advised. 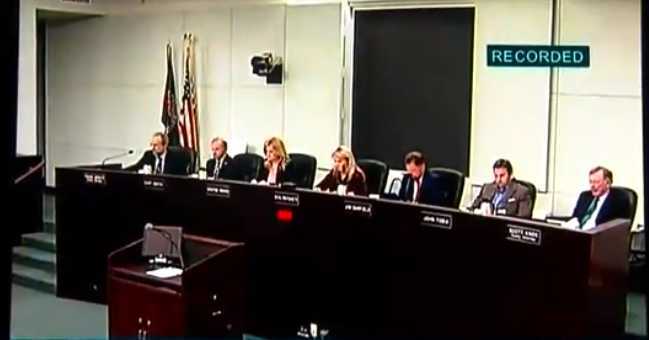 As previously reported, the matter began in 2014 when commissioners voted unanimously to deny a request from atheist David Williamson of the Central Florida Freethought Community after he asked that his group be added to the county’s invocation list. He therefore sued the board, and in September, Antoon issued an injunction in Williamson’s favor. “By opening up its invocation practice to volunteer citizens but requiring that those citizens believe in a ‘higher power’ before they will be permitted to solemnize a board meeting, the County is violating the freedom of religious belief and conscience guaranteed by the Free Exercise Clause,” he contended. Antoon released his final ruling on Nov. 29, asserting that it is discriminatory not to allow atheists, agnostics and humanists to deliver the invocation, and said it was “narrow” to think that prayer is only for those who believe in God. Commissioners voted unanimously to appeal, while also replacing the prayer with a moment of silence—for now.